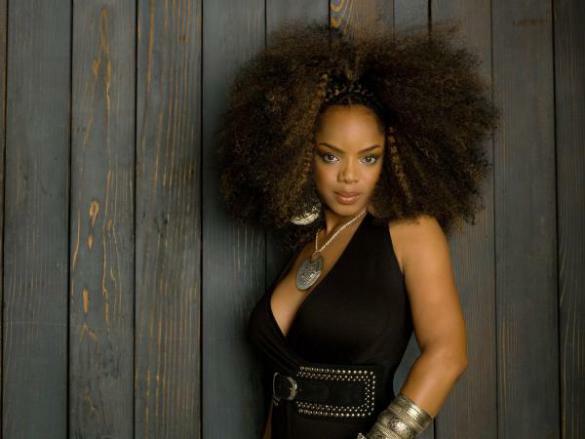 Leela James (born June 2, 1983 in Los Angeles, California) is an American R&B and soul singer-songwriter. James cites singers James Brown, Roberta Flack, Marvin Gaye, Donny Hathaway, Gladys Knight, Mavis Staples, and Stevie Wonder as her influences. Her deep, rich, gritty vocals have drawn comparisons to Aretha Franklin, Chaka Khan, and Tina Turner. James’ debut album, entitled A Change Is Gonna Come, was released on June 21, 2005. The album was conceived as a throwback to an earlier era of American soul music, building upon the legacy of 1960s and 1970s soul singers while incorporating elements of contemporary R&B, funk, and gospel. In the lyrics to the album’s lead single, entitled “Music”, James laments the current state of contemporary popular music. She condemns the glorification of materialism and misogyny that has often been attributed to the lyrical content of contemporary R&B and hip hop songs while pleading for the return of the artistry, dedication, and sincerity displayed by musicians of earlier decades. James co-wrote most of the tracks on her debut album, two exceptions being her covers of the pop rock band No Doubt’s 1996 hit “Don’t Speak” and the classic title song by Sam Cooke, for which the album is named. Notable collaborators on the album include Raphael Saadiq of the 1990s R&B group Tony! Toni! Toné!, Kanye West, and former Fugees member Wyclef Jean. In 2004, James toured as an opening act for The Black Eyed Peas and Macy Gray. That same year, she was featured on hip hop producer, DJ, and emcee Pete Rock’s album Soul Survivor II, providing vocals to the track “No Tears”. In 2005, she lent her voice to the posthumously released Ray Charles album Genius & Friends, duetting with the singer on the song “Compared to What”. Leela also guested on Robert Randolph and the Family Band’s 2006 album Colorblind, lending her vocals to “Stronger”. After parting ways with Warner Bros., James signed with the independent label Shanachie Records and released her second studio album on March 24, 2009, an all-cover set entitled Let’s Do It Again (the title being a homage to the 1975 soundtrack album of the same name by The Staple Singers). In June 2009, she appeared on Moby’s new album “Wait for Me”, performing the vocal on “Walk with Me”. James’ third album My Soul – her debut release for the Stax label – was released on May 24, 2010, and debuted on the US Hip Hop/R&B chart at Number Seven. Speaking exclusively in May 2010 to noted UK soul writer Pete Lewis – Deputy Editor of the award-winning Blues & Soul – she stated: “With this album I wanted to make sure that I showed all sides of me – in terms of variety in the music and in my vocal range – while at the same time making it clear that every song deeply came from my soul. Plus I also wanted to incorporate a little more hip hop this time, and infuse it with my traditional R&B – because I felt that. By making my beats edgier and harder-hitting, I’d show there was more to me than just doing ballads and things of that sort.” In Summer 2010, she appeared on BET’s television series “My Black is Beautiful” as a co-host alongside of Tasha Smith, Kim Coles and Alesha Renee. Wikipedia®.